223/250 is a 2016 Treasure Hunt and 3/5 in the HW Screen Time series. The car has gold metalflake paint with black graphics on the sides and back. 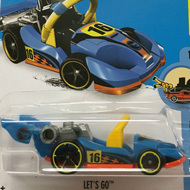 The back also has Hot Wheels logo and the low production symbol. It has a gray interior frame, Muscle Car 5-Spoke wheels with gold rims, and a black plastic Malaysia base. 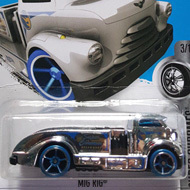 This vehicle can be found in mix “H” of 2016 Hot Wheels mainline cases. 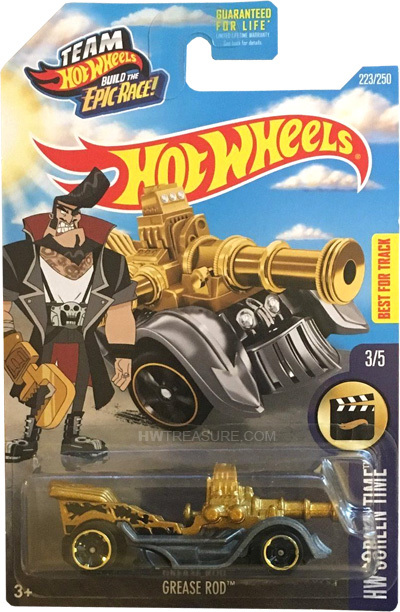 The Grease Rod made its debut in the 2016 HW City – Tooned series. It is a unique design of a classic hot rod that features an open top, cattle catcher grille, and an oversized engine with a cannon-like front.